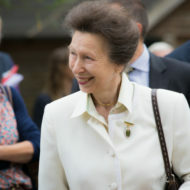 Her Royal Highness, The Princess Royal, Princess Anne is a great supporter of RDA, championing our work as a national charity and visiting our Groups as often as she can. We are grateful for the continued support of Her Royal Highness, whose tireless work and frequent Group visits provide such a boost to our Volunteers and Participants. If you would like Her Royal Highness to visit your Group, Our Executive Coordinator will guide you through the application process and – if your bid is successful – will also help you make the necessary arrangements to ensure the visit goes without a hitch. To register interest in a Royal visit for your Group, please contact your Regional Chairman.